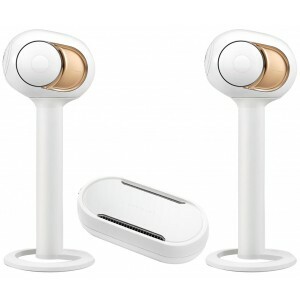 Complete package containing a pair of Gold Phantom wireless speakers with a Dialog intelligent hub and a pair of white tree stands. More than 5 in stock - order now. Earn 5827 loyalty points when you order this item. 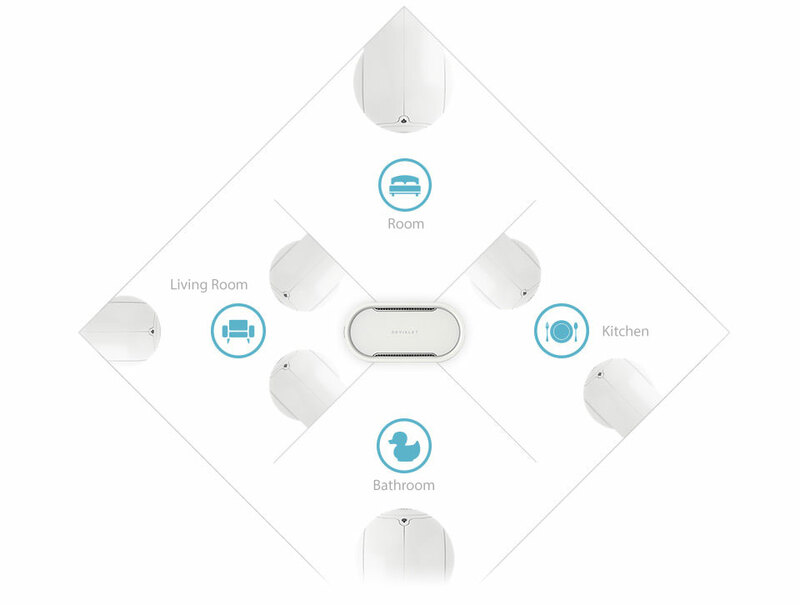 This package gives you everything you need to get your Devialet setup up and running while being optimised for best performance. 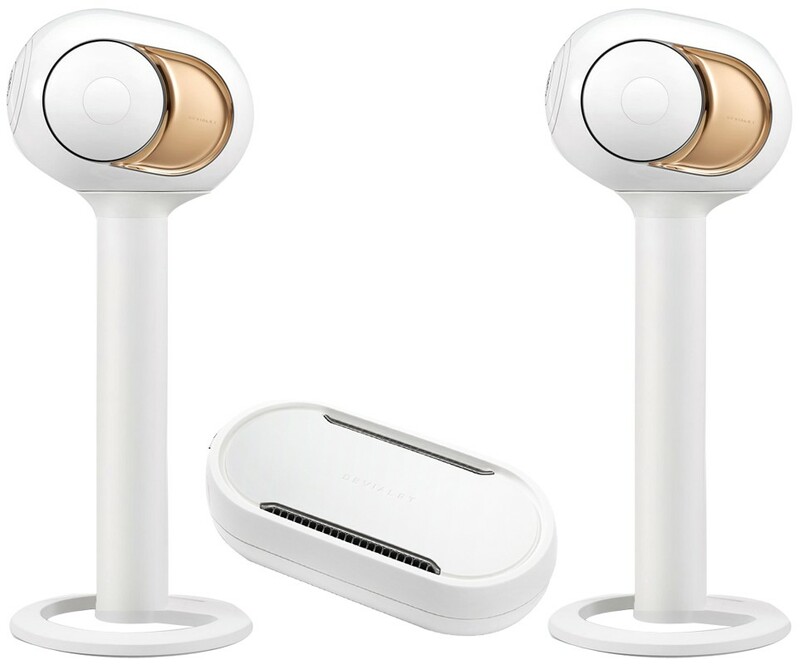 It contains two Devialet Gold Phantom active wireless speakers and a Devialet Dialog allowing you to use the two Phantoms in stereo mode as well as Devialet's tree stands in sleek white. Devialet Gold Phantom is the flagship model of the prestigious range with an exclusive 22 carat Rose-Gold-plated finish and a Grade 1 Titanium tweeter. This ultra compact and powerful wireless active speaker brings high-end sound to your iPhone or iPad. Devialet Gold is 8 times more powerful than Phantom packing 4500 watts of power and 108 decibels of physical impact – equivalent to a live rock concert. Discover ultra-dense sound with carnal power in its most electrifying form down to 14Hz; the lowest sounds ever emitted. The Intelligent Dialog Hub for Phantom speakers lets you create a hi-fi or multiroom listening experience. Use with Devialet's free 'Spark' app to access online streaming services via Wi-Fi. Coated with an ultra resistant and thin white lacquer, White Tree creates an utterly elegant colour unity. It is minimalistic and discreet, hiding all Phantom cables perfectly. Phantom Gold fits steadily on the White Tree stand for a perfect aesthetic and acoustic continuity. For more information on the speakers, visit our main Gold Phantom page. For more information on the speaker hub, visit our main Dialog page. For more information on the speaker stands, visit our main White Tree page.